"I was raised to be a champion. My goal was to win. At what and against whom, those were just details." The other day my boyfriend took me to watch this movie at the theater. We were quite intrigued by this movie because the ratings are pretty decent—82% on Rotten Tomatoes and 7.6 on IMDB. 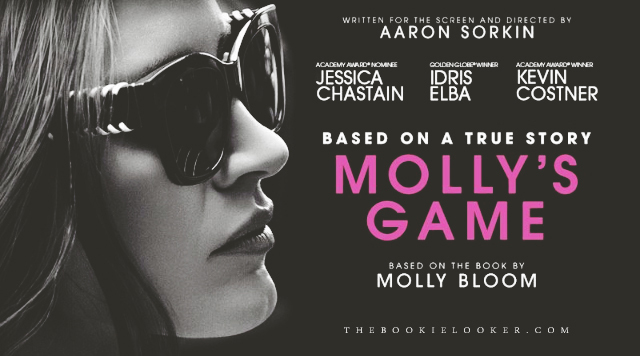 After doing some research, I found out that this movie is based on an autobiography written by Molly Bloom herself about her life that changed drastically from a pro skier to someone who hosts one of the most exclusive underground poker in the world. I didn't expect to enjoy this movie as much as I did (because I rarely watch any biography movies), but I think this movie is really good! 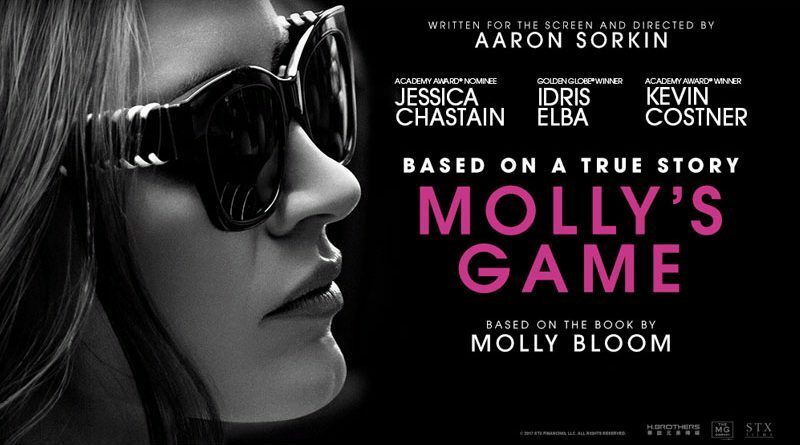 So here's my non-spoiling review for the movie adaptation of Molly's Game. "This is a true story, but except for my own, I've changed all the names. I was in a room with movie stars, directors and business titans. They were going all in, all the time. 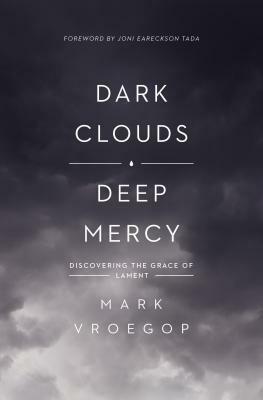 The humiliation had given way to blinding anger at my powerlessness. 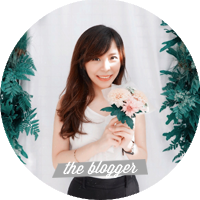 I wasn't going to wait before I put a plan in place." 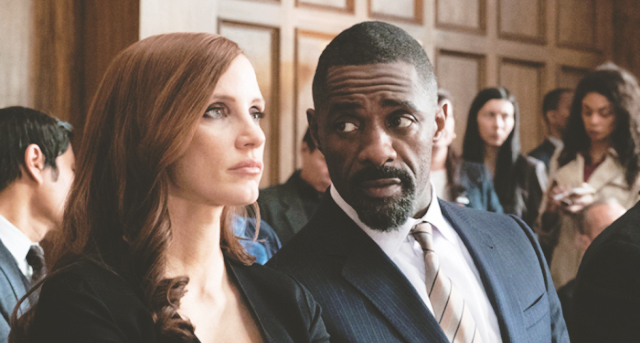 Most of the movie is narrated by Molly Bloom (played by Jessica Chastain), who introduced herself and gives the audience a quick background story about her life. There's a lot of going back and forth between the past and the present. The past tells us what Molly went through in her life; and during the present day she's caught by the FBI and indicted for involving in illegal gambling. I never heard of the book/story before, so I didn't have much expectation, but since the beginning of the movie I was instantly intrigued. The narration really showed what kind of person Molly Bloom is—how intelligent she is, and she also has this ambition to achieve the things that she wants. The best part of this movie for me is the characterization. I think Molly Bloom is portrayed perfectly as an extremely smart person, with all her achievements and skills. The actress did really well with the portrayal of this character. The way she walks, the way she looks at people, and especially the way she talks. When Molly's talking, she's always ready with a response when the other person just finished their sentence 😂. She's very straightforward and doesn't need bulls**t from anyone—which makes Molly an interesting character to watch. "If you think a princess can do what I did, you're incorrect. I’m getting it, you don’t think much of me, but what if every single one of your ill-informed, unsophisticated opinions about me were wrong?" Another one of my favorite character is Molly's lawyer—Charlie Jaffey (played by Idris Elba). I really like Idris Elba since the movie Pacific Rim where he becomes a general. The actor successfully portrayed the image of a lawyer who doesn't play dirty; someone who's honest, stands firm on his principles, and will fight for what he knows is right. His arguments with Molly was always entertaining and I love their dynamic; because most of the time Molly always outsmart him. But ultimately, Molly is genuinely touched by Charlie's faith in her and how he defended her until the end. "You've seen what’s on those hard drives. Families, lives, careers will be ruined... I’ll tell them everything they want to know about me, about me. That's it." The last character that I think also played a huge role is Molly's father, Larry Bloom (played by Kevin Costner). I've watched a lot of Kevin Costner's movies in the past and I'm a huge fan. Even though he doesn't show up a lot in this movie, his demanding and harsh character can be seen clearly. I'm glad the movie revealed the truth behind Molly and her father's bitter relationship; and I think it ended on a heartwarming note. Have you seen this movie adaptation? What are your thoughts about it?